Interested in becoming a Glasshat partner, but want to know more? We've put together this info sheet that details what Glasshat is, how it works and what makes us different from other SEO platforms. The search industry is changing quickly and the old rules of SEO no longer apply. Glasshat is on a mission to disrupt and innovate the way that businesses go about planning the digital marketing for their business online. Glasshat is a SaaS platform that helps agencies and online marketers systematically identify which digital marketing activities offer the best pay off to help grow their client’s online presence and visibility in the search engine results. Glasshat brings a radically different approach to digital marketing by using a custom built algorithm to collect and scientifically analyse thousands of pieces of data across hundreds of online competitors for each keyword a business wants to rank for. Glasshat is the only tool that generates a list of actionable insights, based on the data, that are shown to the user in prioritised order (i.e. those which will have most impact are shown first). Each recommended activity comes with time estimation for completion and step by step instructions on how to complete. Glasshat is the only platform that closes the loop on these activities, meaning the technology has the ability to systematically learn which things work, are most accepted by users and how long they actually take to have an impact for all industries and sectors online. 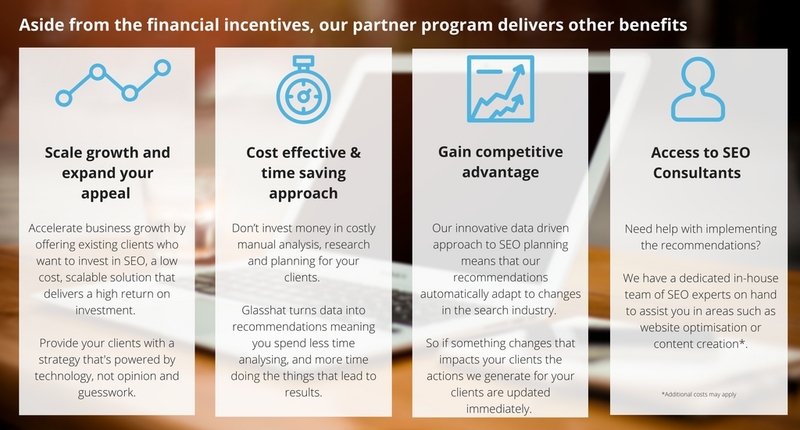 Glasshat technology uses a proprietary Digital Marketing activity database, algorithms and deep-learning to understand for each specific website in a particular environment, which activities will have most impact, how long they will take to complete, and the exact steps that need to be followed to implement. What the benefits of using Glasshat to drive your client's SEO Strategy? Glasshat turns data into recommendations meaning you spend less time analysing, and more time doing the things that lead to results. Every Glasshat Action is supported by detailed step-by-step guidance, how-to-guides, live examples and easy to use templates. Interested in using Glasshat platform to drive the SEO campaigns for your clients? Learn more about our partner program here. Want to know more? Get in touch. Please, let us know the best time to contact you by phone (if provided).